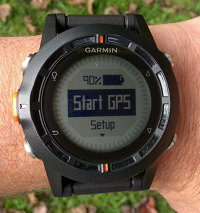 The Garmin Fenix is a new backcountry sportswatch, Garmin’s first to use their popular Forerunner form factor. With an up to 50 hour battery life, this wrist-top GPS is most likely to appeal to two classes of users: (1) those who want both hands free (rock climbers, off trail hikers, and even some hunters and fishermen) and (2) those who demand a long battery life, such as backpackers. The fenix feels a little large on my (admittedly skinny) wrist, as you can see above. You probably don’t want to use it when you’re out stylin’ on the town, or even in your office unless you’re surrounding by geeks, but it isn’t too big for the outdoors. I’d rather have this on my wrist than carry a Montana. Here you can see the back of the watch and the USB charger. An AC charger is also included. I found it awkward to connect the charger, but only the first few times. Now it’s second nature. Charging takes about 2-1/2 hours with the li-ion battery fully drained. The fenix will hold 1000 waypoints, 50 routes, 10,000 trackpoints, 100 saved tracks and 2,000 geocaches. It is rated as waterproof to 50 meters. The fenix has five buttons, shown in the image below. The functions are about as intuitive as you could wish for on a device like this, and you’re not likely to forget what they do after using it a time or two. The up and down buttons on the right can be customized for what happens when you hold them down. Unfortunately those options are pretty limited (e.g., Start/Stop, Lap, Man Overboard, Flashlight). Once you power on the fenix, you’ll be greeted with the first screen, which is typically a clock screen, depending upon the profile you are using (more on profiles shortly). Press the orange button and you’ll see the screen at right. It’s very important to realize that the watch doesn’t start receiving satellites upon powering on; you have to select start GPS first. It took me a couple of times to realize this, which left me cooling my heels at the trailhead while I waited a minute or two for it to acquire satellites. Between profile options, multiple screens and a wealth of data fields, the fenix can be heavily customized. You can select your activity type by choosing a pre-loaded profile. These include hiking, running, cycling, geocaching, fishing, sailing, aviation, and mountaineering, but you can also create your own. Changes made to data pages and selection of data fields within a profile are saved, so you’ll have the same setup the next time you return to that profile. These are the pages within a profile that the up and down buttons scroll though. Under Setup > Data Pages, you’ll get separate options for setting up screens while Tracking or Navigating. Typically, depending upon which profile you are modifying, 7 or 8 pages are available, but more can be added. Standard pages can include one to three data fields, and there are also barometer, compass, map, heart rate, cadence, time, dual grid screens, altimeter, and temperature screens (the last two are shown below). I won’t go into all the menu options, but I did have a request to list the available data fields. They are: accuracy, ambient pressure, ascent, average ascent, average cadence, average descent, average heart rate, average lap, average pace, average speed, barometer, battery, bearing, cadence, calories, compass heading, compass, course, date, descent, distance, elevation, final destination, final distance, final ETA, final ETE, final location, final vertical distance, final vertical speed, glide ratio, GPS, GPS elevation, GPS heading, glide ratio destination destination, grade, heading, heart rate, heart rate zone, lap ascent, lap cadence, last descent, lap distance, lap heart rate, lap pace, lap speed, lap time, lap total, laps, lat/lon, last lap ascent, last lap cadence, last lap descent, last lap distance, last lap heart rate, last lap pace, last lap speed, last lap time, location, max ascent, max descent, max elevation, max speed, max temperature, minimum elevation, minimum temperature, moving average, moving time, next destination, next distance, next ETA, next ETE, next vertical distance, none, odometer,off course, pace, speed, stop time, stop watch, sunrise, sunset, temperature, time, timer, to course, time of day, track distance, turn, vertical speed and velocity made good. Whew! The fenix works as well for navigation as any GPS without a map. It does have a rudimentary map, shown at right, but if you want a GPS with a map, this isn’t the model for you. And while I am definitely into maps, I didn’t have any trouble navigating to a destination or along a route with the fenix, While doing the latter, the fenix advanced to the next waypoint promptly. In the images below, you can see two pointer marks on the perimeter of the screen. These act as a bearing pointer anytime you are actively navigating. I was very pleased to see that the fenix includes advanced track navigation, which automatically creates a route with any of your waypoints along a track, as well as key high and low elevation points (shown at left below), whenever you navigate a track or use trackback. At right below you can see the distance to next waypoint along the track in the top data field. The only points of interest (POI) data on the device is a list of cities; there is no geographic POI dataset, which would be nice for navigation purposes. I was able to upload a custom POI (.gpi) file using Garmin POI Loader though, so that is another way to get the data in there. I’m an Android guy, so I wasn’t able to test the app. The fenix has built-in Bluetooth SMART/4.0 and ANT+ functionality. The former is how it communicates with iOS devices. ANT+ gives the fenix the ability to pair with sensors such as compatible heart rate monitors, tempe temperature sensor (review forthcoming) and the chirp geocaching sensor. The fenix has paperless geocaching capabilities, although it does not have a built-in filter function. But you can still view logs, hints, etc., and it can hold 2,000 caches. You can see a couple of screenshots below. I did see some sluggishness with the unit on occasion but it was pretty rare. I noticed it more loading and viewing geocache information than any other time. Since it was so spotty, I’m assuming the processor is adequate and they just need to tweak the firmware some. Hopefully that will happen. I also saw some other random bugs that I can no longer replicate and I’m assuming they were fixed in the 2.60 or 2.70 firmware updates. To test tracklog accuracy, I wore the fenix on my wrist and mounted several other units on the handlebars of my mountain bike. I rode an out and back section of logging road that has at least one challenging section for GPS reception, where the trail is pinched by rock walls in a canyon-like setting. All units were set to record one trackpoint per second. The main things I try to look for in this sort of test are stray track points and track separation, i.e., how far apart the track collected by each unit was on the out and back sections. You can click the image below for a larger view. The fenix is in red, 62s in orange, eTrex 20 in blue and Oregon 450 in purple. The fenix did very well, especially for a new unit (firmware updates tend to improve things). The peak track separation was only 65′, though one stray track point where I stopped to chat with a couple of mushroom hunters was 100′ off. At a couple of other stops though, the fenix show no significant stray points, even though other units did. The GPSMAP 62s performed best, with track separation errors up to about 45′ and one stray point at a rest stop about 70′ off the road. My Oregon 450 was the worst, with track separation errors up to 180′. Coming in better than that but worst than the 62s and fenix was the eTrex 20, with tracklog separation errors of up to 100′. I’ve seen a great deal of variation within a single unit in terms of accurately tracking elevation. So I put a fair amount of effort into eliminating as many variables as possible for this test. All units were tested using the most recent firmware update, and set to collect one trackpoint per second. They were then reset, clearing the tracklog and trip data, and calibrated at a USGS benchmark (2384′). All units except the wrist-mounted fenix were on the handlebars of my mountain bike. I then proceeded to climb a hill that, according to USGS maps, should have been about a 430′ climb, with perhaps 10′ of descent at one culvert crossing. All units were equipped with a barometric altimeter. I’ll also note that I picked a calm day when little change in barometric pressure was anticipated. You can see the results below. I recorded reported elevation, total ascent and total descent, both at the top of the ride and at the bottom. In terms of reported ascent, the fenix outperformed the other models. Nevertheless, I would take this with a grain of salt, since altimeter performance is highly variable in handheld GPS receivers. I’ve yet to come up with a good test for geocaching, but I did take the fenix and a few other models to three geocaches and recorded the reported distance to cache with each unit on top of the cache. Remember that the units aren’t showing distance to the cache location necessarily, but distance to the coordinates posted by the cache owner, which are likely off to some extent. Regardless, the fenix came out in the middle of the pack, behind the eTrex 20 and Oregon 450, but ahead of the 62s. I’d take these results with a big grain of salt too. I tested the battery, leaving the device stationary until the battery went from 100% to 0% and shut down. The fenix ran for 18 hours and 4 minutes with the tracklog set to auto, and 18 hours with it set to once per second. I did not test Ultratrac mode which claims a battery life of 50 hours. I’ve been told by a couple of folks now that you can add small detailed map (.img) files to the fenix. To the right is one sent to me by Brent, showing a residential street and a trail. The fenix is a good solution for those wanting a hands-free backcountry GPS or long battery life. I found it surprisingly easy to use, and have been pleased with the speed of firmware updates and the improvements that have been made in them. Hopefully Garmin will give us offline maps for the BaseCamp Mobile app and bring said app to Android. If they can do those things, they’ll have a solid offering with the fenix. In short, I like it and look forward to what they will be able to do with the fenix/BaseCamp Mobile app combo. You can also load a small detailed mapset to this unit via Mapsource. I saw someone else say that. Wish I had tried it. Got pics? I can try to get some, but I don’t know how to upload them here. You would have to upload them to a third party service like http://imageshack.us/. Or you can email them to me at richowings+uploads at gmail dot com. I might append them to the review if that’s okay with you. I emailed them to you. Let me know if that works. my device don’t working and stop display in time mode. message : low memory.Delete data to continue. how do I make try my Device for normalization? Let me make it please.